During the PADI Divemaster program, you learn dive leadership skills through both classroom and independent study. You complete water skills and stamina exercises, as well as training exercises that stretch your ability to organize and solve problems. You will put this knowledge into action through our internship scheme. As this is an internship, the course duration is subject to your availability for attendance at the NDAC. Be certified as a PADI Advanced Open Water Diver, or have a qualifying certification from another training organisation. Be certified as a PADI/SDI Rescue Diver, or have a qualifying certification from another training organisation. Proof of Emergency First Response Primary Care (CPR) and Secondary Care (First Aid) training (or other qualifying CPR/First Aid training) within the last 24 months. Submit medical clearance for diving signed by a physician, attesting to fitness to dive. The medical clearance must be current within the previous 12 months. The next induction weekend for aspiring dive professionals is to be confirmed. The Induction weekend is planned as a series of presentations to aspiring dive professionals, mostly to discuss exactly how the professional training will run with our training program and courses. Divemaster candidate intakes take place several times per year. Contact us for further information. The road to becoming a PADI Instructor can be intense and not everyone has the time to complete the Instructor Development Course (IDC) all at once. Becoming a PADI Assistant Instructor allows you to break down the IDC to fit around your family, work and personal commitments. As a PADI Assistant Instructor you work in partnership with a PADI Instructor to provide student divers with quality knowledge and skill development during PADI programs. The teaching skills you will develop during your training will allow you to independently conduct several PADI programs. Tuition cost only. This does not include the required course materials. Be certified as a PADI Divemaster or leadership-level with another diver training organisation (please contact Lee for details on qualifying credentials). Medical Statement for a diving medical examination conducted within the past 12 months i.e. HSE Diver Medical. Have been a certified diver for at least six months and have completed and logged 60 dives showing experience in night diving, deep diving and underwater navigation. If not a PADI Divemaster, you will need to successfully complete the PADI Divemaster course dive rescue assessment. Custom courses are available on demand throughout the year to suit your time schedule. Contact us for further details and to arrange a date. 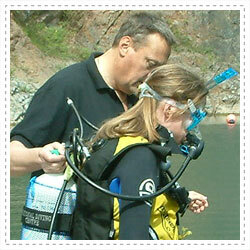 Ever wanted to share the thrills and fun of diving with others? Being a PADI Divemaster isnt enough for you? Then join the worlds leading diver certification organisation and get in shape to become a PADI Open Water Scuba Instructor. The PADI Open Water Scuba Instructor (OWSI) rating is the first PADI Instructor level attained by dive professionals. During your IDC training (or OWSI training if your already a PADI Assistant Instructor), you will review PADI Standards, procedures, philosophies and teaching methods as well as hone your practical teaching ability, watermanship and diving knowledge. After successfully completing a PADI Instructor Examination (IE), OWSIs take responsibility for introducing people to scuba diving through various PADI programs and courses. Teaching status PADI Open Water Scuba Instructors May 2019 conduct the entire range of PADI programs from Discover Scuba Diving up to Divemaster (except for specialities which require specific Speciality Instructor ratings). IDC (AI & OSWI sections) - 8 days. OSWI section only - 5 days. (Tuition costs only. These do not include the required course materials). We try to run our IDCs as close as possible to the PADI Instructor Examinations (IE). Please Contact us for details. The Instructor course provides you with the additional training necessary to teach the Emergency First Response Primary Care (CPR), Secondary Care (First Aid) and Care for Children courses. (Region-specific courses including First Aid at Work Asia Pacific and First Aid at Work Great Britain require additional training.) Through a multi-media approach of independent study, classroom sessions and practical teaching assignments, you learn to conduct Emergency First Response courses. To enrol on the Emergency First Response Instructor course, you must be 18 years old and have completed adult, child and infant CPR and first aid training in the past 24 months or a be a practicing medical professional such as a physician, Emergency Medical Technician, Paramedic and Registered Nurse. You'll learn how to conduct the Emergency First Response Primary Care (CPR) and Emergency First Response Secondary Care (first aid) courses and Care For Children. You’ll also learn to conduct the recommended Automated External Defibrillator (AED), emergency oxygen and conscious choking management skills. EFR + CFC (Care for Children) or Equivalent from other Agency. Or being a professional medical person. 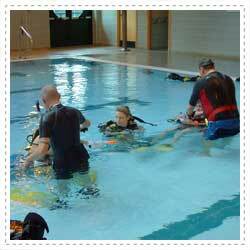 This Program is designed to train competent sport diving instructors to teach at all levels of technical courses. Contact us at the centre and have a chat to discuss your requirements.